Well, better late than never, as they say. Sometimes the days and weeks just get away from me, you know? Let’s jump right in with the first recipe I lost. Giving me printed recipes is proving to be quite a hazard, for I seem unable to retain said printed recipes between the point of time known as when I leave bake night, and the point of time known as when I arrive back at my house. The arrival at said house is followed by a shorter but no less complex section of time, which exists between my front door and my computer. Oh where did you go, printed recipes of mystery? You were not within the purple bag with the rest of the stuff, even though I distinctly remember putting you in there amongst the chaos of cakes, cutlery, plates and other sundries. But you weren’t there. You weren’t anywhere. It was like you had simply vanished, like a Dan Brown plotline. These were Jennifer’s spiced cupcakes. It’s also my favourite cakey photo of the night. 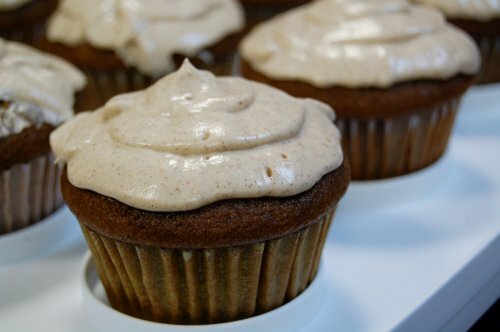 Since I lost the recipe, which she had photocopied from a book, and since the book has now gone back to the library, if you want it you’ll have to read Donna Kauffman’s Sugar Rush, which you’ll find is part of the Cupcake Romance series. 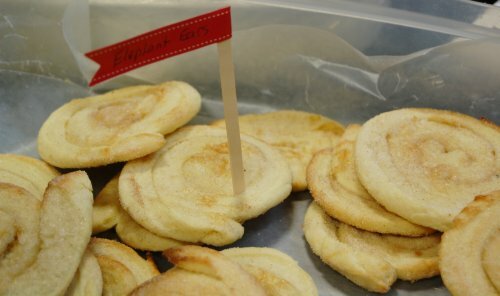 The next recipe I lost was the one for Laura’s Elephant Ears, which were inspired by the book Water for Elephants by Sara Gruen. Here it gets even more hilarious. Laura’s recipe was the only one that I had managed to find. However, it appears I only typed out one line of the instructions to go with the recipe, and now, as I attempt to blog weeks later, I have incomplete recipe. Also, of course by now I really have lost the paper, which is this case had been a page from a magazine. Talk about a dangling plot line. Right about now we should all be grateful I even manage to get to the meetups that I organize. So here is the recipe and the mysterious instructions fragment. 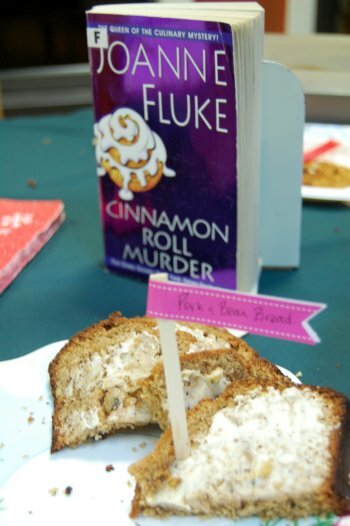 The third recipe I lost was Jean’s Pork and Bean Bread, from Joanne Fluke’s Cinnamon Roll Murder. Jean had even written it out beautifully on a recipe card, along with one for Scottish Meat Pies. Sigh. However, Jean emailed me the bread recipe again, so here it is! Spray and line 2 9×5″ loaf pans. Don’t drain the beans, but do remove the pork pieces. Pour beans into food processor and puree until smooth. Place the eggs in a large mixing bowl and add the puree and mix well. Add vegetable oil and mix well again. Add sugar and mix. Add the baking soda, baking powder, salt and cinnamon. Stir to incorporate everything, Stir in the walnuts. Add the flour 1 c. at a time, stirring after each addition. Spoon into pans and bake 350′ for 50-60 minutes. (mine were done after 50 minutes) Cool on a rack for 20 minutes, then remove. 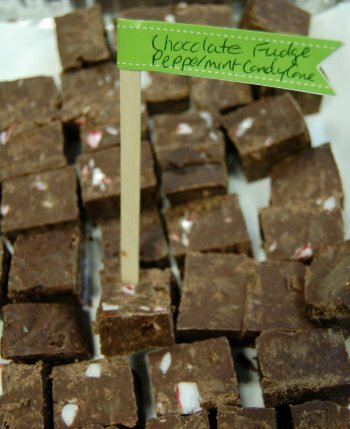 The last recipe I lost was Lory’s Chocolate Peppermint Fudge, but luckily she emailed it to me as well, so your last minute Christmas treat making is saved. Prep a 8 x 8 loaf pan by lining with tin foil, spray lightly with Pam or Crisco. Set aside. Mix chocolate chips, sweetened condensed milk & butter in a microwaveable bowl. Microwave for 1 1/2 mins. on high. Stir well until melted. Do not over heat. Mix in vanilla & salt and any optional ingredients. Spread into prepared loaf pan. Let set in the fridge for approx. 1 hour. Invert onto cutting board, remove foil and slice into small squares. Serve at room temperature. I don’t have the recipe for Janice’s Carrot Cake, however, the power of this cake is in the United Nations of dried fruit convening therein. 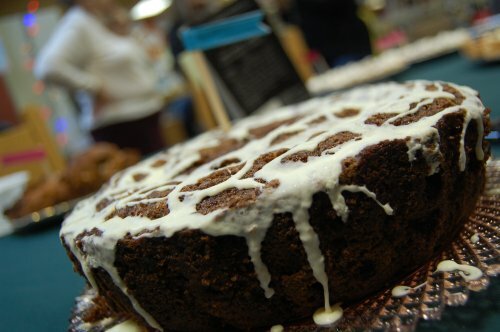 Take your usual carrot cake recipes, with their polite calls for a few raisins, and scoff at them. Next, take any and all of the dried fruit that has taken refuge in your cupboard throughout various baking adventures. Throw them all in there. Spice that cake up. Bake. What will emerge is what can only be described as the badass of carrot cakes. You couldn’t drink a weak tea with this cake – it would have to be a tea with an equally tough sounding name, like grand cru matcha or cold zing (those are actual David’s Tea flavours, btw. Yes, I just googled the names of tea so I could pick out the ones that sounded gangster enough to match a carrot cake. Because that’s how I roll, yo). Also, as was suggested to me by a friend on Facebook, such a cake would certainly be a match for Tracy Lauren Marrow, aka Ice T. Certainly, a slice could also be saved for Mr. T.
Okay, are we ready for some Chocolate Pie? 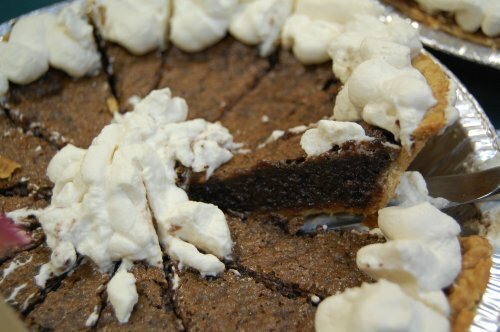 Here we have Wendy’s Chocolate Pie, inspired by The Help. Remember to add booze to the whipped cream, for that extra dose of delicious. 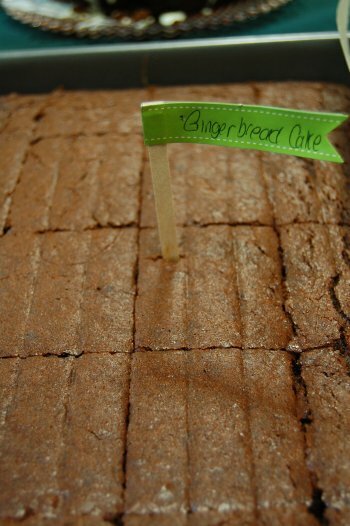 Next we have Carmen’s Gingerbread Cake, which as we recall includes optional rum! Another cake deserving of a strong tea is Kim’s Dundee Cake. 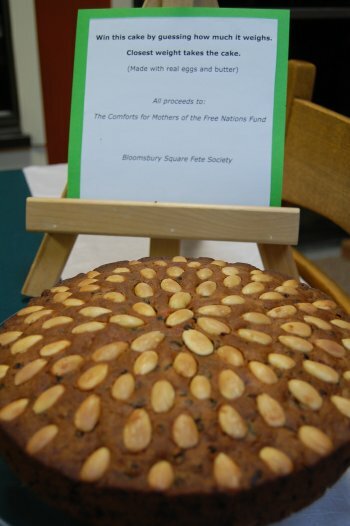 From Kim: Dundee cake, with its trademark pattern of almonds on top, features prominently in Graham Greene’s novel The Ministry of Fear. In fact, in the first chapter, the cake takes on a life of its own. The novel takes place in war torn Britain – a time when eggs and butter are in short supply so this cake takes on a particular significance. Mystery, intrigue, mistaken identity, poisoning, amnesia and fear make for a lovely combination when paired with a cup of tea and a piece of Dundee cake on a dark, dreary winter afternoon. A wee dram of whisky on the side would not go amiss. This is a very easy cake to make (Sophia: it didn’t look easy to me…) and it is ever so satisfying. Dundee cake differs from other fruitcakes in that no spices added. I have taken the liberty of adding vanilla because, well, it just adds to the deliciousness. If you have time to let the cake age so much the better but I have found it to be good eating immediately. In other words, on the day it is baked slosh 1⁄4 cup rum on the cake and slosh the remaining 1⁄4 cup in a glass for yourself. Line bottom and side of 9” spring form pan with parchment paper. In a large bowl, beat butter with sugar until creamy; beat in eggs one at a time beating well after each addition. In a separate bowl mix flour and baking powder. Stir in raisins, currants, peel, cherries, orange and lemon rinds until separated and coated. Gradually stir into butter mixture until combined. Scrape into prepared pan. Smooth top. Place blanched almonds in concentric circles over batter. Bake in the centre of oven; place a loaf pan with very hot water beside cake on rack. Bake until golden and cake tester inserted in centre comes out clean. About 1 1⁄2 hours. Wrap in cheesecloth and slosh 1⁄4 cup whisky over top an sides of cake. Marinate for one week and pour remaining 1⁄4 cup of whiskey on cake and marinate for a further week. If you can wait that long. It should be said that Jan’s Black Bird Pie does not actually contain any black birds. Served with a sweet chilli sauce, these are so very splendid. In a skillet, cook the pork with the herbs then add the chicken. Use a thickening agent of your choice and create some gravy. Add remaining flavourings (to your taste). Let it cool a bit. Roll the pastry. 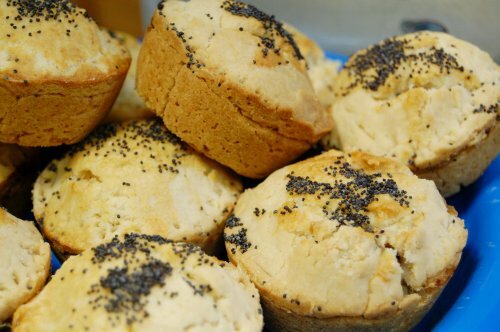 Cut into rounds large enough to fit into muffin cups. Sandra’s Sicky Fig Cakes with Caramel Sauce. Again, this the kind of cake a great explorer would take with her on a voyage on danger and discovery. It is already a cake with gumption, but the caramel sauce adds a huge hit of additional decadence. Novice cake eaters need not apply here. Trim the stem of each fig and cut them into quarters. Place the figs and prunes in a stainless steel saucepan. Pour the water over them and bring to a boil. Cool slightly, (do not drain off water) then transfer to a food processor and puree; add the baking soda, pulse, and set aside. Beat the butter and sugar in a medium bowl until mixture is light and creamy in colour. Add the eggs one at a time, beating after each addition. Stir together the flour baking powder, and lemon zest in a small bowl. Pour the fig mixture along with the flour mixture into the bowl with the butter and eggs and stir well. Add the chopped chocolate and spoon the mixture into 4oz (1/2 cup)( I measured 1/4 cup per muffin – and it made 1 dozen plus extra for small 4×4 pan) muffin pans. Bake in a preheated 325 oven for 25minutes, until a toothpick inserted into the middle of a muffin comes out clean. 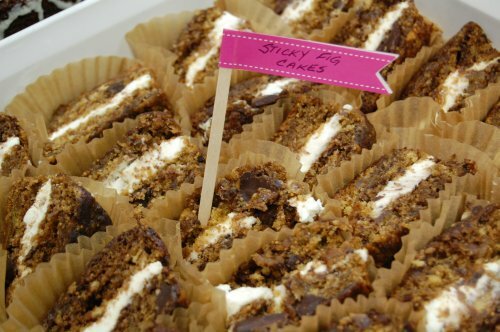 To serve, split the mini cakes in half, spread with whipped cream cheese (or mascarpone) and drizzle with caramel sauce. Combine the sugar, water and lemon juice in a heavy-bottomed pot. Bring to a boil and continue to boil until the sugar begins to turn a light amber colour. At this point, it darkens very quickly; watch it carefully so that it doesn’t burn. The darker the colour gets, the deeper the flavour becomes (Take off heat when it turns amber – as it still continues to cook after removed from heat). Slowly whisk in the cream. It will spit and spatter, so be careful. Cool to room temperature. Pour it on anything and everything. 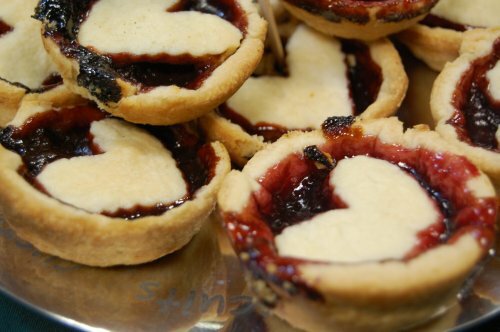 Finally, here are my Queen of Hearts Jam Tarts, which looked more broken hearted than I had attended. Thanks for putting up with me, everyone. What a lot of work you have gone to Sophia! Thank you so much. My recipe for the Elephant Ears is basically just a sweet dough, roll out, slather the filling on, roll up and then slice as if you were going to make cinnamon buns. Then sprinkle sugar and cinnamon on your counter, and roll out each cinnamon roll (flatten like ears) and bake at about 375 for about 15 min. Easy. Fun.